Trolley Books asked Fruitmachine to work with renowned Taiwanese photographer Chien-Chi Chang to produce a book of images of the Long Fa Tang Temple in Taiwan. The images consisted of 700 mental patients rejected from their families and living chained together working as slaves. Going through and having seen the photo story we were producing, Fruitmachine along with our publisher Gigi Giannuzzi of Trolley Books, had the great idea to design the book using a folding concertina, allowing us to join all the pages together. This was a literal remark to the conditions that the featured patients had to live and work. The cover is detachable with a pocket at either end that holds the first and last pages in place. 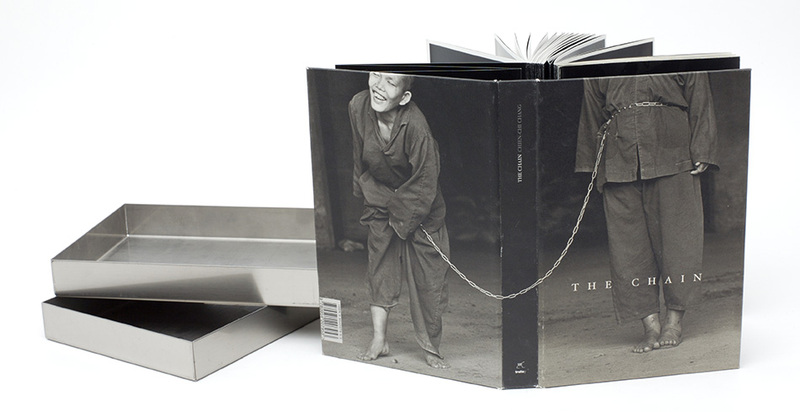 The cover image is a spread that is split across the spine, where the chain linking the subjects continues from the front to the back cover.